The online database utilizes a "drill-down" approach, taking advantage of the hierarchical nature of taxonomic, stratigraphic, chronologic, and geographic data to allow interested parties to look for specimens or localities at several discrete levels. Additionally, more than 1000 of the 41,000 catalogued specimens are digitally illustrated in the on-line database, and an image of the fossil will pop up when it is selected. The format of the database will continue to evolve over the next few months, and of course the database itself will grow as we catalog additional specimens. Updates will be incremental, probably occurring several times a year, and will eventually be automated. The paleontology collection at the NMMNH reflects the diverse efforts of museum personnel, their collaborators, and volunteers for the past twenty years. The collection currently holds almost 400 type specimens, including more than 85 published holotypes, 121 paratypes, and 169 topotypes, as well as thousands of illustrated specimens, principally from New Mexico but including fossils from across the United States and some international holdings. Key strength areas include Paleozoic tetrapod footprints, Upper Triassic tetrapods, Upper Cretaceous and Paleogene tetrapods, and Neogene mammals. 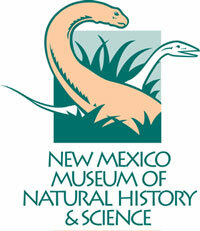 All illustrations used on the NMMNH web page are copyrighted but provided to the NMMNH by their creators. If you have any questions, comments, or concerns, please feel free to contact the NMMNH Geoscience Collections Manager, Dr. Andrew B. Heckert.